If you want to create a successful brand online, social media really matters. Let us help you to use it more effectively. Our team applies social media marketing strategies to increase your brand recognition, more exposures to convert, improve your brand loyalty and increase leads and sales. We provide social media strategy ideas and campaign managements, custom social page design and more. Our consultation and design services will help your business become social. 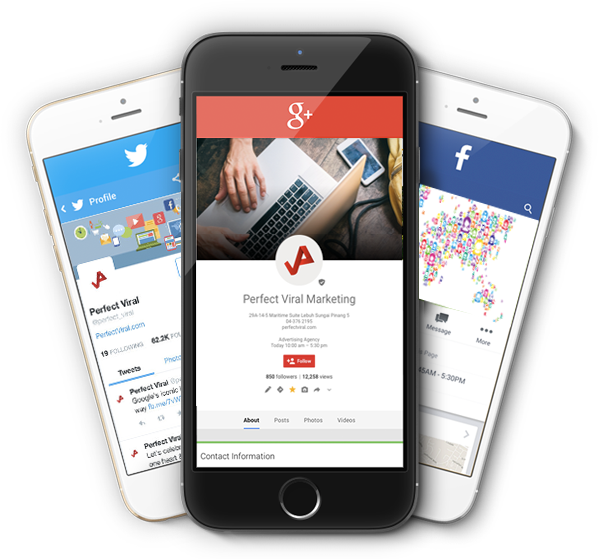 We work with leading platforms such as Facebook, Twitter, Youtube, Google Plus and LinkedIn to boost your businesses audience across the web. Please get in touch with us to organise a discussion to understand your social media marketing goals and needs. Engaging with brands & hash tagging trending topics, is all part of the appeal of this feathery social channel. It allows us to broadcast, outreach & follow influential twitter accounts in order to get recognition for your content in the form of retweets, favourites & follows. This is the most underestimated platform available, with the ability to get maximum exposure for content through communities. Any local business on Google maps, automatically have a local G+ Page so we concentrate on building the page through networking, reviews & engaging posts to get some +1 love! A brilliant platform to use to your advantage, in order to market your business with engaging posts & competitions. The option to compliment an organic social strategy, with some targeted paid advertisement to a specific demographic can be a winning combination. Take a look at some of the benefits of launching your social campaign with us today. If you would like anymore information on the services we provide please do not hesitate to get in touch and speak with our team of social media experts. We focus on quality rather than quantity, creating engaging visual content which will ensure a rounded ROI on social to not only get your brand noticed but get traffic to your website and increase enquiries. Our creative approach means that no two social campaigns are alike. We prefer to think outside the box, evolving your campaign month by month as your social presence grows.